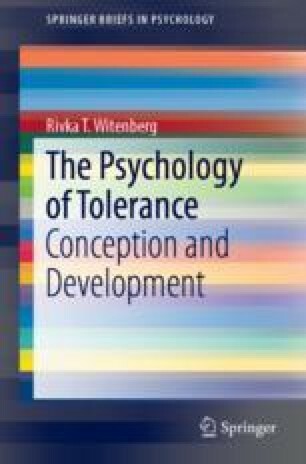 The psychological research about tolerance to human diversity provides some initial empirical evidence about what underlies and motivates tolerance. These findings have without doubt some possible implications for teaching tolerance. Essentially programs about the promotion of tolerance to human diversity and acceptance of others have a tendency to concentrate on how to eliminate prejudice and discrimination with the idea that tolerance will emerge. While undoubtedly, they are useful educational tools, one of the criticisms of such programs is that they draw unnecessary attention to difference, particularly with young children and that they are problematic in classrooms with diverse student populations of colour, creed and culture. However, there is an alternative way to approach the education and promotion of tolerance and acceptance. Research presented earlier in this book shows that beliefs in fairness (justice, equality and equity) empathy (sympathy, compassion and care) and reason (logic and open-mindedness) underpin tolerance. My contention is that programs teaching and encouraging justice, fairness and empathy are better tools to develop tolerance and acceptance. Blum, L. (1999). Shared values and particular identities in anti-racist education. Available online at: http://www.ed.uiuc.edu/eps/PES.